For Adam Goodes and Michael O’Loughlin, the action wasn’t all on-field during the AFL’s recent Indigenous Round. 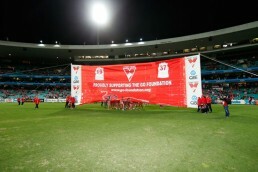 The Sydney Swans’ Thursday night blockbuster against Geelong at the SCG was dedicated to publicising the work of the GO Foundation as well as raising funds via various means throughout the evening. GO Foundation flyers were distributed throughout the venue’s many corporate areas, while patrons arriving at the ground were encouraged to make their contribution to GO at numerous collection points. The team took the field through a GO-themed banner, and the Chairman’s pre-match function featured an interview with Michael O’Loughlin, who explained the work of the Foundation and expressed his gratitude that the AFL’s Indigenous Round was the perfect vehicle for GO to raise the profile of its work. While Adam Goodes and his team-mates took a well-earned break at half time, Michael was again in the spotlight, as on behalf of GO he accepted a generous donation of $25,000 from the Chairman of the QBE Foundation, Tony MacRae. The philosophy of the QBE Foundation is to support charities that help people overcome disadvantage, strengthen their abilities and live more independently, successfully and productively – an ethos MacRae said he believes is a perfect fit with the aims of the GO Foundation. Earlier in the week, Adam and Michael were guests at the AFL’s official Indigenous Round launch, held in Sydney for the first time – where again the Sydney Swans were able to affirm the Club’s support of the GO Foundation as the Club joined the AFL in launching a Reconciliation Action Plan (RAP).